Nicholas L. Smith ’79 was intrigued by “The Pioneers,” our September/October article about the first women who earned Yale PhDs. He sent the Yale Alumni Magazine a photograph that intrigued us even more. “After I read the magazine’s article,” he wrote, “the rarity of photos of Yale women students surprised me. 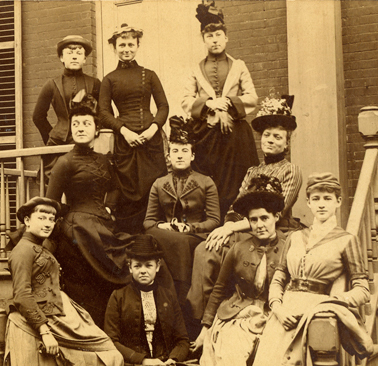 That is when I dug through my collection of memorabilia to find this picture.… It is an old photo from an estate in Connecticut, with a statement on the back of the photo that this was Yale’s ‘first women class.’” Smith, a connoisseur of Yale history, bought the photo out of curiosity when he saw it offered for sale online some time ago. Unfortunately, no names are on the photo, and there is no other information associated with it. The women in the picture do not appear to be the same women featured in the article, and they weren’t familiar to Judith Schiff, our Old Yale columnist and Yale’s chief research archivist. They might be other women who were admitted with the first group of 20 female graduate students, or women who took classes in the music or art school, which were both coeducational from the start; or the phrase “first women class” might refer to something else entirely. Nicholas Smith is donating his photo to Yale. We invite all readers to donate their educated guesses. Send them to yam@yale.edu or Yale Alumni Magazine, P.O. Box 1905, New Haven, CT 06509-1905.—Eds. I read with interest Kathrin Day Lassila’s From the Editor column about her mother, Jean Lassila ’61PhD, and her experience as a graduate student in chemistry at Yale (“Family Chemistry,” September/October). I entered the Yale PhD program in 1962, the year after Lassila’s mother received her PhD. Yale chemistry was a male bastion when I entered. My memory is that we had no women in our entering chemistry class of about 40 students. That was the end of the interview. I was so upset that instead of spending the weekend at Yale as I had planned, I jumped on the next bus back to Holyoke. When I got to my dorm, there was a letter of acceptance from Yale, delivered while I had been away. Who would accept someone before an interview? Was the only purpose of the interview to tell me not to come to Yale? Paula went on to obtain her PhD from the University of Virginia and subsequently has had a distinguished career at the University of California–Santa Barbara, while raising three children. She is the author of one of the leading undergraduate textbooks, Organic Chemistry, now in its sixth edition. Your article brought back strong recollections of my own experiences seeking my LLB at Yale Law School. Three months after I started there in 1955, I met and fell in love with my husband-to-be, then in his third year at the medical school. We married in June, and by September, I unexpectedly found myself pregnant. I took the maximum number of courses during my second year in order to have more time in my third year to devote to my baby. I recall volunteering to be the first to deliver my term paper in Bayless Manning’s class, for fear that an earlier-than-expected labor would interfere with my obligation to present the paper orally. Shortly thereafter I walked to the delivery room at Yale–New Haven Hospital with an armload of law books so that I would not waste a moment preparing for the forthcoming final exams. One day in my third year, my baby sitter called to say she could not come that morning. Rather than miss my class, I wheeled my sleeping son into the law school, thinking I could park his carriage in the hall at the back door, so I could hear him if he awakened. But he did awaken, and I did not hear him. As I exited the room at class end, I found my baby in the arms of my idol, Professor Thomas Emerson [’28, ’31LLB]. I have never forgotten that moment or his kindness. Sure it was hard, but harder still was getting my first legal job, in Baltimore, in 1958, where all the law firms were racially and religiously segregated, and all excluded women. However, I was hired as an assistant general counsel of the old Department of Health, Education, and Welfare, handling Social Security litigation and, later, writing regulations for the new Medicare program. Subsequently, I became an assistant attorney general of Maryland, assigned to the University of Maryland, and finally spent 28 exhilarating years as vice president and general counsel of Johns Hopkins University. My wife Connie and I enjoyed reading your presentation of the stories of early PhD females at Yale (“The Pioneers,” September/October) and Kathrin Day Lassila’s editorial. We understand that Connie was the first female to get a degree in engineering at Yale. She was accepted as Consuelo W. Minnich in spring 1951 after graduating from the University of Illinois in civil engineering, and she arrived in class that autumn as Consuelo M. Hauser, after our marriage on September 2. Since C comes before R, she received her Master of Engineering diploma a few seconds before I got mine. Connie had a fruitful career as a professional engineer, working for municipalities, consultants, and aerospace, and partnering with me in Hauser Laboratories. She raised three delightful and capable daughters, of whom two are engineers, and a son who is now teaching music education at Concordia University. It hangs proudly on the walls of our home office. Your otherwise charming editorial in the September/October issue contains the following distressing (to me) sentence: “Although I can’t tell you what her paper, ‘Direct Observation of Ketene Intermediates in Photochemical Reactions,’ means, it has become part of the intellectual architecture of her area.” It is good to point out that one’s mother did important work, but what does the first phrase do except either to call attention (unnecessarily) to the author’s lack of training in chemistry or—more likely—propagate the great sin that ignorance of science is a virtue. I was doing undergraduate chemical research in my senior year at Yale (1961–62) when I first met Jean Lassila. My impression then was of an austere, intimidating, and impressive woman, with whom I chose my words very carefully lest I appear to be a dunce. I went off to graduate school at Caltech, and by 1965 I was an assistant professor at Northwestern. In 1968, I was invited to give a colloquium at Iowa State [where Lassila was a researcher], and I met her again with pleasure. Far from being austere and intimidating, she was still impressive, but very friendly. I was very much aware that she was sorely underplaced at Iowa State, and I wondered whether it was by choice. I never considered raising the subject. Her textbooks followed, and we occasionally crossed paths again. The scary Yale postdoc was a wonderful colleague. It was in part due to the impressions I came away with after that visit to Iowa, contemplating how one of the world’s smartest women (so she seemed to me) was in that position, that I set about at Northwestern to encourage women to embrace a full career without sacrificing having a family. In the ’70s and ’80s, I had the largest female proportion of graduate students in chemistry at Northwestern. I graduated almost 20 women out of my 50 PhDs, all of whom continue to have full careers in chemistry or related areas. (One is retired.) All but five also had children. The first, a Mount Holyoke product, graduated in 1972. She had three sons and continues to accomplish remarkable things as a professor at Rhode Island College. At my retirement, in 2010, she gave a talk about her career (at my request), and I learned some of the uncomfortable things that happened to her as a female graduate student from 1968 to 1972. The professor never knows the full story. My wife and one daughter also are chemistry PhDs, and both have had excellent careers with numerous publications. The world has changed. A few days after Bart Giamatti died in 1989, our class secretary circulated his essay “The Green Fields of the Mind” to his classmates in Yale ’60. I am not sure whether I had seen this piece before, and I surely had no idea of how Bart had come to write it (“The Story of ‘Green Fields of the Mind,’” September/October). I was quite struck by the essay, receiving it as I did so soon after Bart’s passing. My wife, Ann, then dying of lung cancer, also lingered over the essay and returned to it several times. A few weeks later she was gone, and I asked the minister presiding at her memorial service to read excerpts from the essay on that rainy November day in Birmingham, Michigan. Bart’s essay matched the end-of-season mood of the morning while also providing a certain amount of comfort, especially for me. Your recipe for the Yale cocktail (“Liquid Lux et Veritas,” September/October), calls for Crème Yvette. I live in Portland, Oregon, a fairly sophisticated place, and cannot locate this liqueur after an online search. Would you help me with this, perhaps in giving me another name this cordial goes by, or what I might substitute? Crème Yvette only recently became available in the United States. Some mixologists suggest that another liqueur, Crème de Violette, is a reasonable substitute. —Eds. The sustained hectoring of Singapore by democracy purists (Letters, September/October) is not justified by empirical reality. During the past years tens of thousands of social and political blogs have emerged in Singapore, many of them including sustained political commentary frequently critical of the PAP (People’s Action Party) government. I have lived in Singapore and taught at both what was then Nanyang University and the National University of Singapore. I travel frequently to Singapore and will return this winter to conduct research and continue publishing on Singapore. Singapore’s policy of political openness began more than two decades ago. There are many other autonomous input mechanisms, including honest balloting and vote counting. Singapore is one of the very few postwar states built on meritocracy, fiscal discipline, an unwavering anti-corruption policy, private sector growth, and development policies that preclude a permanent and growing underclass. It also has been on a sustained democratic path for more than two decades; witness the May 2011 elections where the opposition garnered 39.86 percent of the popular vote. For 20 years after gaining its independence in 1965, Singapore stressed inculcating a mentality of survivalism, discipline, and each citizen contributing according to his or her ability. There was no room for slackers in an island state bereft of most natural resources except for human resources, location, and the only deepwater port in the region. The Communist threat was real, and Singapore became a prototype of how to build and prosper, which includes an anti-corruption program starting at the political top through the entire political system. A basic right to economic security and opportunity has been accompanied by progressive democratization of the island state’s political system. Few Pacific Rim countries provide the political pluralism and security that Singapore offers today. There is no better location in Southeast Asia for Yale to have a presence than Singapore. If, like most fashions, what we see now worn at Yale has such a personal look, it is, inevitably, not without aspects of the uniform, but far more liberated than what was worn in my day (“A Guide to Student Style,” September/October). Coming to Yale from overseas and having attended “progressive” or “creative” schools, I was saucer-eyed at the monotony and conformity of college attire. If the money was on hand, J. Press and Chipp dressed you; if not, one strove for their look. My look was different. My parents sent clothing from England, most notably a toggle coat. Shirts were either readily washable in the college sink, red Aertex knits, or, when need be, hideously transparent, hellishly hot, white “drip-dries.” Supposedly they never needed pressing, but their wearer looked put through the wringer. Though I was kindly treated by my professors, the more esthetic among them blanched upon witnessing my lamentable wardrobe. One of them was particularly distressed by a more or less iridescent, or changeant, raincoat, to which I was inordinately attached. He found such flamboyance insufferable and characterized that beloved coat of many colors as my “Jewish raincoat.” This designation was certainly true for the wearer and probably its manufacturer too, but by his so identifying such non-Ivy covering, I learned a lot from, but also about, my teacher. Any deviation from the uniform was an unacceptable accent upon the unassimilable—or, worse yet, the wearer’s possible independence from wanting, or needing, to belong. After attending my first Yale reunion, I was disappointed to see absolutely no people of color in any of the photos featured in your Reunion Notes pages (July/August). Yes, people of color do attend reunions, and yes, they also donate to Yale. If it is important to Yale to encourage greater attendance at reunions, engender ongoing connections with Yale, and increase fund-raising, it would be wise to consider including at least a few of these photos in the magazine. The mistake was not Yale’s but ours: the Yale Alumni Magazine is published by a separate, alumni-based nonprofit. But it is important to us to represent Yale and its alumni accurately. We blew it this time, and we regret it.—Eds. I read with interest that Yale–New Haven Hospital intends to purchase or otherwise acquire the Hospital of Saint Raphael in New Haven, which is affiliated with the Roman Catholic Church (“Campus Clips,” July/August). Having learned that some Roman Catholic hospitals require their secular purchasers to follow Roman Catholic practices and teaching in matters of fertility and abortion, my concern is whether Yale–New Haven’s acquisition of Saint Raphael will be contingent on an agreement by Yale or Yale–New Haven to withhold or refuse abortions and/or counsel about and dissemination of contraceptive devices and practices. In short, my question is this: will patients at Saint Raphael, after acquisition, receive the same medical care and advice and have the same availability of abortion and contraception as are lawful in Connecticut and are open to patients at Yale–New Haven Hospital? I very much hope so. Robert Hutchison, a spokesman for Yale–New Haven Hospital (which is separate from Yale University, although Yale doctors practice there and Yale officials sit on its board), says that “on the Saint Raphael Campus, caregivers will follow the Catholic Ethical and Religious Directives in the delivery of clinical services on that campus.” Those directives forbid abortion and the promotion of contraception. Hutchison adds that “all employees—including new employees transitioning with the acquisition—will have access to insurance coverage of birth control and family planning services.”—Eds. I well remember Calhoun College’s stained glass windows, one of which had a small view of black field hands picking cotton (Old Yale, July/August). This part of the window was “accidentally” broken by one of the college’s black students when he was moving furniture into, or out of, Calhoun’s dining hall for a weekend mixer some time between 1968 and 1972. You can break a window (or change a college name), but it doesn’t change history. In our article about A. Bartlett Giamatti’s baseball essay “The Green Fields of the Mind” (Sporting Life, September/October), we misspelled the name of Roberto González Echevarría, the Sterling Professor of Hispanic and Comparative Literature. We regret the error. The Yale Alumni Magazine posts up-to-the-minute news on our news blog, 06520, and links to it all on Facebook. Here is a smattering of the alumni comment on our Facebook page. Join in!